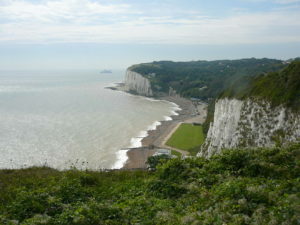 Dover is a great location which is worth visiting . The fossils are found as flint casts in the chalk. The best place to find fossils is the large rock which is found west of the steps and is the most productive and accessible areas. As most of the rock erodes, the fossils get slowly revealed. The fossils can be extracted by using a hammer and chisel. The smaller rocks falls to the east of the steps which contain fossils, but the boulders which comprise these are generally hard to climb. The ubiquitous flint nodules have sea urchins. Although the bay has nodules which are rolled, the most commonly found fossils are the Micraster sp sea urchins which are commonly seen. Also present are Sternotaxis sp. and Echinocorys scutata, along with more ornate regular urchins. Apart from this fossils such as brachiopods, bivalves and gastropods are seen. The site can be accessed by walking from St Margret’s Bay to the east which is however a rather long walk. Alternatively one could scramble over the groynes on the beach, from the harbour itself but this is not recommended. One needs to go through a large amount of chalk in search of the fossils, that you should find at least a few specimens which are good. Generally, if a rock falls, there is plenty to find. The journey to the cliffs is rather challenging for the children and elderly. Sometime back, access was through a flight of stairs down the cliff called Akers Steps, however it is now permanently shut. Now one needs to travel a longer distance in difficult terrain prior to reaching St. Margaret’s Bay. The individuals travelling needs to be extremely careful if climbing through boulders and scrambling as falling could be inevitable otherwise. The beach down has high tides as well during certain times so one needs to be cautious. The fossils can be found in the cliffs, shingle and boulders. The cliffs are unsteady and constantly rumbling thus it should be avoided prior to major falls. It is also important to look among flint pebbles as well as cobbles for sea urchins. 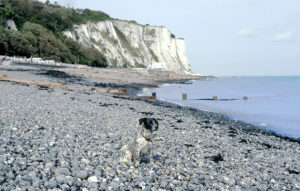 The fossils could be found in the foreshore and also at the base of the cliff in either direction from Langdon Hole. It is safest to check for fossils when there is low tide at the foreshore. The entire stretch has chalk boulders and flint nodules scattered which has a constant supply of fossils.